Chamomile tea is a classic calming product for people under stress. It is also good for the stomach. Chamomile (Chamomilla recutita) is one of our oldest and most well-known medical plants. It has been used for healing since the time of the Ancient Greeks and it was included in the Stockholm Pharmacopoeia  as well as in the Swedish pharmacopoeias from the first to the eighth edition [1775–1901]. 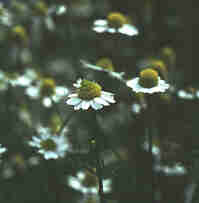 Nowadays the chamomile flower has a place in the European pharmacopoeia. Many different substances have been identified from chamomile over the years, but it is now thought that the effects are due to essential oils and flavonoids. The flavonoids constitute the water-soluble, the non-volatile part of the chamomile’s active substances, whereas essential oils principally consist of substances which are hard to dissolve in water but easy to dissolve in alcohol and other organic solvents. Essential oils also have the property of accompanying the steam from a hot-water solution making the effect better from an alcohol infusion than from tea. Chamomile and its constituent substances have been the topics of many scientific studies and the medical effects are considered to be a result the various components which have both similar and partially different effects. Among other things, chamomile has shown anti-inflammatory activity and to heal wounds. It has a mildly calming effect on mice and the substance apigenin inhibits panic and has a mildly sedative effect which also induces the relaxation of muscles. The calming effects are considered to result from a flavonoid binding to certain receptors in the brain and thus explains the relaxing effect of chamomile. Essential oils have demonstrated anti-inflammatory effects, the ability to reduce fever and act as antispasmodics, all of which are important for ailments of the stomach and intestinal tracts. The anti-inflammatory effect is explained by the chamomile extract inhibiting the release of substances that causes inflammation. These effects are caused by essential oils and flavonoids. Chamomile tea is prepared from dried flowers and used for fortifying the stomach, the release of gases, strengthening nerves and for relieving cramp. Its main use is internal for stomach and intestinal problems as well as against menstrual discomfort, but it can also be used externally for inflammation and irritation of skin and mucous tissues.